Updated: Automated building controls, meet demand response. Australian startup BuildingIQ announced this week that its automated system turned down power use at a Perth, Australia city building in response to a demand response system now being piloted by utility Western Power. BuildingIQ CEO Mike Zimmerman says it’s the first time a building control optimization system has automatically met a utility’s demand to turn down power to manage peak load. But if Zimmerman has his way, the system will soon be tested out in the U.S. as well. Automating demand response in commercial buildings could be a massive business. Most of the 40 gigawatts or so of DR capacity in the U.S. today is managed via emails, phone calls, pager messages and other relatively low-tech methods. Letting a demand response message turn down power directly in buildings is more common in industrial settings, where factory managers tend to have sophisticated control systems already in place. Commercial buildings are a tougher sell, Zimmerman, mainly because they have to keep tenant operations — and comfort — in strict focus. Big property management firms have strict service agreements with their tenants, and they don’t approve of turning off lights or HVAC systems just to save on energy bills. 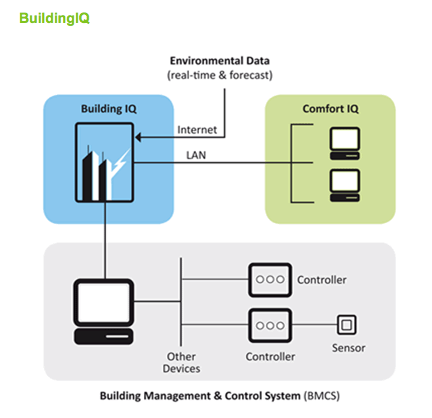 BuildingIQ’s “predictive energy optimization” system, based on technology from Australian national research lab CSIRO, manages these factors by crunching weather reports, building control system data, energy pricing information, and online surveys of tenant comfort, among other sources of information. That allows the system to fine-tune building control systems with energy prices in mind, Zimmerman explained to us. One example is “pre-cooling,” or ramping up AC units in advance of a spike in commercial energy rates, then letting them idle through the expensive peak price window, usually a few hours in the late afternoon. BuildingIQ has delivered 20 to 30 percent reductions in energy use in pilots in Australia through such measures, which can go toward reducing energy bills, making carbon emission reduction targets, or participating in demand response events — the latter tempting because they offer payment to the building owner for power turned down on top of whatever they save in energy bills. The system integrates with building management systems (BMS) from vendors like Honeywell (s HON), Johnson Controls (s JCI) and Siemens (s SI) that together hold some 60 percent of the market, Zimmerman said. He intends to announce some go-to-market partnerships with unnamed BMS vendors in the near future, he added. It will be interesting to see how BuildingIQ’s software-based optimization system mixes and matches with the rapidly automating world of demand response. That world includes EnerNoc’s (s ENOC) PowerTalk platform, Comverge’s (s COMV) Apollo software system and Berkeley Labs’ OpenADR system now being tested in Southern California by Honeywell and its recent acquisition, OpenADR server maker Akuacom. There are also more smart grid-focused projects underway that could also automate commercial buildings for energy efficiency and demand response. Cisco’s (s CSCO) Building Mediator product ties multiple buildings into a single, IP-enabled interface for energy controls, and IBM (s IBM) is working on similar building-IT integration with Johnson Controls. BuildingIQ’s technology acts as a software retrofit of existing building automation systems and each building needs only one server that links to the company’s cloud-based optimization engine. That makes its software similar to products from startups like “continuous commissioning” software maker Scientific Conservation or Cimetrics, which crunches building data to fine-tune temperatures. The difference is that Scientific Conservation and Cimetrics provide data without direct controlling building management systems like BuildingIQ does, Zimmerman said. With so many overlapping venues to link smart grid and building control systems, it will be fascinating to watch how they’re all put together. To read all of my daily curated news links, my weekly column and my research reports check out the Green IT page on GigaOM Pro (subscription required).